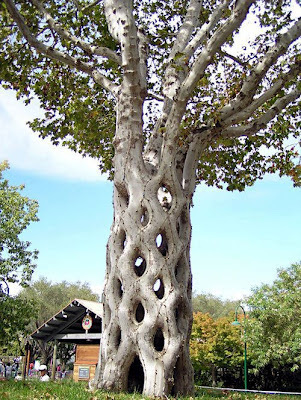 As a hobby, bean farmer Axel Erlandson shaped trees – he pruned, bent, and grafted trees into fantastic shapes and called them "Circus Trees." For example, to make this "Basket Tree" arborsculpture, Erlandson planted six sycamore trees in a circle and then grafted them together to form the diamond patterns. topped them all at one foot, then approach-grafted them together one to another to form the diamond patterns. For the first 2.5 meters (8') he left an opening at the top. Today his trees are the center pieces of Gilroy Gardens in Gilroy California, including the Basket Tree. I would love to see one of these trees in reality, they look stunning (although I would have to keep the kids away as they looks as if they're begging to be climbed!! ).